This is my favorite time of the year! I've never really decorated my own place or gotten a tree since I always celebrate at my parents' and sister's places and I never felt the urge to do anything with my apartment. I'm known in my family as the "Holiday Nazi" and yet I'm also extremely lazy and never really cared about how my apartments looked. Now that I have a house to call my own I've been slowly doing more, starting with my first Christmas tree (artificial, but hey, baby steps), lights and stockings. So despite all the stress of the season, family dramas, and work demands, I'm just sticking cotton in my ears and singing falalalala! 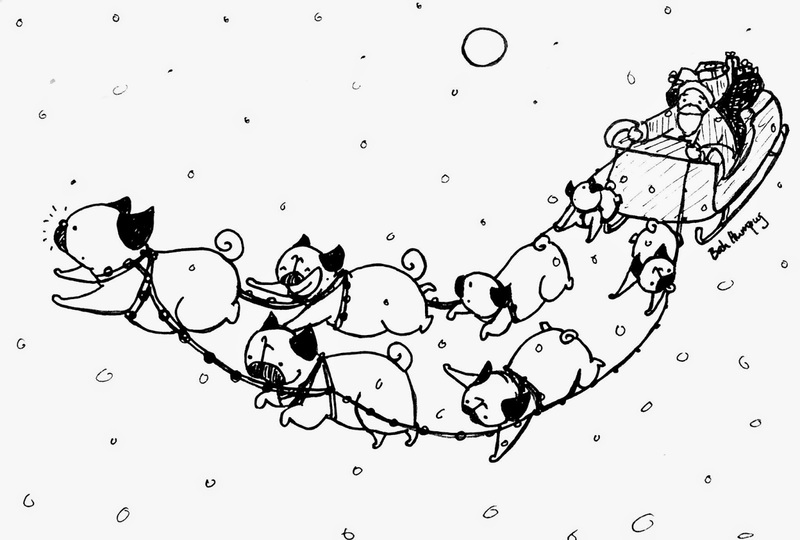 So in the spirit of the season, here are some reinpugs guiding Santa's sleigh. I'm sure his bag is filled with tons of toys and treats for good lil boy dogs and girl dogs! These would be so cute as Christmas Cards! This is so perfect!! Merry Pugmas to you and the girls! This is adorable! I hope you and the girls enjoy your first Christmas in your new home! love these roly poly reinpugs!